is on the U.S. National Register of Historic Places. Built in 1918 by architect Willis Polk. 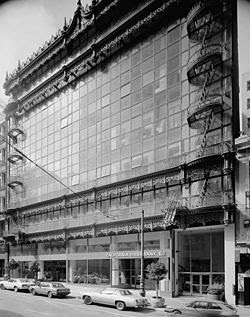 building in the U.S. to have glass outer walls. ARCHITECTURAL TOURIST--As an airline inflight magazine writer I had 48 hours to research a city before flying back home. In the days before Google and Google maps, the best way to learn the ins and outs of a city was to take the usual double decker city tour. That tour wasn’t necessarily to discover hidden gems, but mainly to get your local bearings. City tour buses work for me today as well. Next, I’d meet up with a local travel reporter that I had arranged to meet earlier. A quick breakfast gave me two pieces of information. I now had a local writer that I could depend on to send my editor travel stories in the future and the writer gave me enough “locals-only” tips to fill my article. Because most travelers today don’t have media access, a nice tip to your hotel concierge will likely gather just as many gems as I would have found. And, if your hotel doesn’t have a concierge, well what can I say? No concierge reminds me of my father’s definition of “wilderness roughing” (drum roll) and that would be anyplace where he couldn’t hail a cab to take him to the nearest comfortable pub. One question to ask your concierge is: who offers city walking tours? A recent trip to San Francisco, I was tipped by the Handerly Hotel concierge (http://sf.handlery.com/) about professional tour guide Rick Evans, who operates a one-man tour operation. Bottom line: I gave Rick’s daily Architectural Financial District Walking Tour ($20 each) five stars. I viewed three buildings that the AIA considers among the 100 most important anywhere.